Who doesn’t enjoy a peaceful, sound sleep? It is hands down the most refreshing way to rest our weary minds and bodies. But how many of us struggle with some kind of sleep disorder these days? This article will provide some easy to use sleep improvement tips and explain how a full spectrum CBD might bring your mind, body, and sleep patterns into balance. From having trouble getting asleep, to not making it through the night without waking up several times — tossing, turning, sweating, panic, nightmares…the dark can bring out our worst fears. Money, stress, family life, just living in this harsh reality can keep even the most stoic of us awake and restless. Often, when we seek help for our sleep issues, we are given pharmaceutical medicines such as Ambien, Trazadone and Xanax. And hey, they do work…for a while. Then you will find you need more and more, or that you are exhibiting alarming side-effects like memory loss, foggy brain, or some truly bizarre Ambien side effects like turning all of your potted plants upside down during an Ambien blackout (just google “crazy ambien stories” for more reasons to never try it, or quickly find an alternative). Now there are many ways to improve your “sleep hygiene,” and your sleep aids should fit within this more holistic model of life/being. Big Pharma tends to compartmentalize and supercharge active ingredients to put the biggest bandaid on the problem, but what actually heals is treating the root cause. That root is often traumatic stress and endocannabinoid deficiency due to drugs, alcohol, and environmental toxins. You’re probably already experiencing how difficult this one-two punch of stress and biochemical imbalance can make life. If you are concerned about CBD and/or medical marijuana, here are some ways to improve your sleep without cannabinoid assistance. Please always bear in mind that because of the federal government’s misguided and militant stance on Marijuana, we don’t have as much peer review “gold standard” research as we should, but what’s out there sure points to the efficacy of Medical Marijuana and CBD for sleep. Thankfully we can count on our friends over at GW Pharmaceuticals to provide some convincing research results! “Experience to date with Sativex in numerous Phase I-III studies in 2000 subjects with 1000 patient years of exposure demonstrate marked improvement in subjective sleep parameters in patients with a wide variety of pain conditions including multiple sclerosis, peripheral neuropathic pain, intractable cancer pain, and rheumatoid arthritis, with an acceptable adverse event profile. 40–50% of subjects attained good or very good sleep quality! This is huge! With no tolerance or need for dosage increases! Even studies for Ambien and benzodiazepines like Xanax don’t have this type of success rate. In fact, one study, Insomnia in hospitalized psychiatric patients: prevalence and associated factors (Neuropsychiatric Disease & Treatment, April 2018, NIH) concluded that 67.4% of the patients experienced more severe insomnia due to the presence of antidepressants and benzodiazepines. Guaranteed side effects AND a 2 out of 3 chance at the OPPOSITE of what you want? We deserve better solutions. We have better options. Other studies carried out by Big Pharma investigating cannabinoids and obstructive sleep apnea suggest that synthetic cannabinoids such as nabilone and dronabinol may have short-term benefit for sleep apnea due to their modulatory effects on serotonin-mediated apneas. They sought to alleviate the suffering of a ten-year-old girl who was sexually abused and had minimal parental supervision as a young child under the age of five. Pharmaceutical medications provided partial relief, but results were not long-lasting, and there were major side effects. “A trial of cannabidiol oil resulted in a maintained decrease in anxiety and a steady improvement in the quality and quantity of the patient’s sleep. Cannabidiol oil, an increasingly popular treatment of anxiety and sleep issues, has been documented as being an effective alternative to pharmaceutical medications. We need more of this brave research from scientists in states where Marijuana is legal. Here in Florida, we extend our gratitude to scholars at the University of Florida who are leading the nation on research for Medical Marijuana for HIV/AIDS. And finally, we know that CBD reduces cortisol levels, which alleviates that jangled nerves feeling so that you can get a calmer night’s sleep. Will You Choose The Road Less Traveled? Here we are again at the crossroads…are you beginning to open up to new ways of thinking about Marijuana and CBD? Well, let your awakening be the beginnings of a whole new way to approach getting back in balance naturally, achieving homeostasis by replenishing your endocannabinoid system, and getting a great night’s sleep! Whatever CBD you try, make sure it’s organic, full-spectrum, and has complete lab test results. 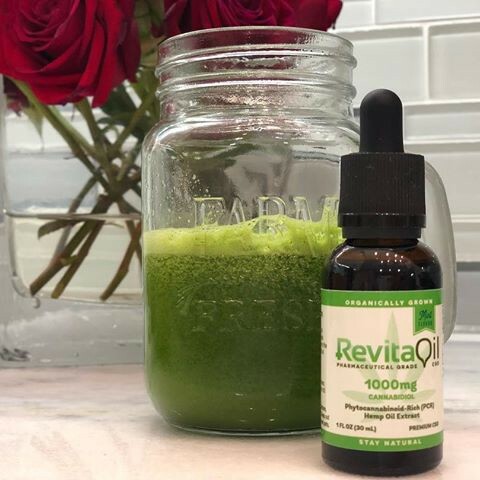 RevitaOil has all of those requirements and more!